Do you remember that time I made 150 cake pops in my shoebox a.k.a. my kitchen? 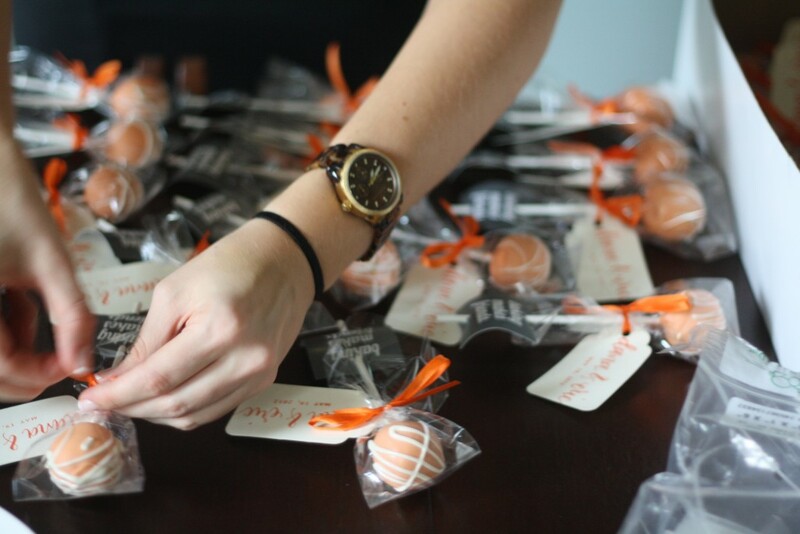 Do you also remember that time that I had never made one single cake pop and decided that my first attempt should include one hundred and fifty to be given away as favors at my friends’ wedding. It’s okay – we can all laugh now at the ridiculousness of how I didn’t think I needed a test round. This is a happy story! 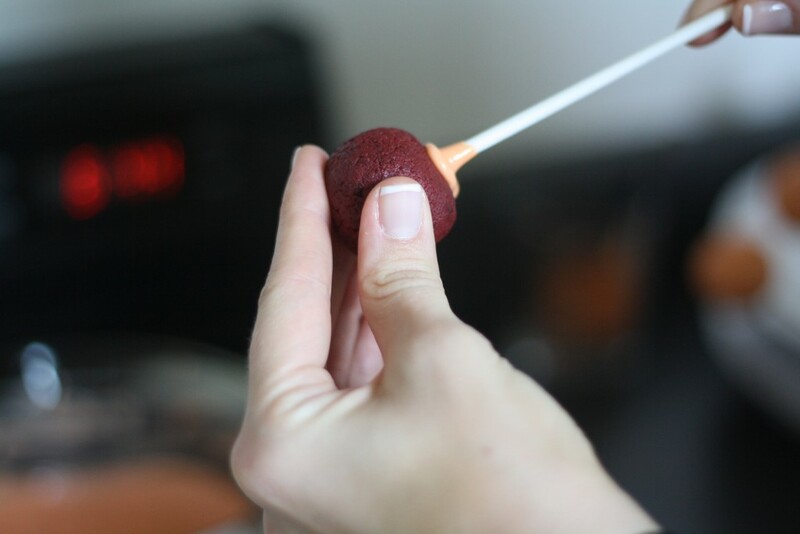 If you ever find yourself in a situation where you are going to make more than one dozen cake pops for a wedding where actual people will be enjoying them – then this post is for you. I am here to tell you that you can do it and it will all be fine. It was an absolute honor to be involved in the wedding of my dear friends and to be able to give the gift of baking to everyone at the celebration. I learned a few things along the way. The most important being organization. Make lists. Try to anticipate all the scenarios that you are going to encounter on your journey. Clean out your fridge. Buy supplies. Go back and get more chocolate after you wake up in the middle of the night thinking that four pounds of white chocolate just won’t be enough. Chart out a timeline and work backwards. In my case the cake pops were being picked up Thursday. I did supply shopping on Monday. Food shopping (did I mention that I made everything from scratch!) on Tuesday. 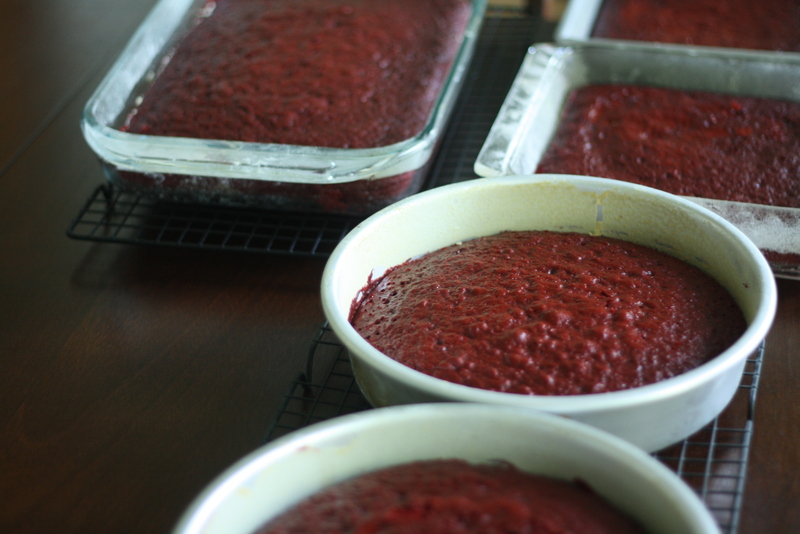 A bit of unanticipated wine-drinking happened on Wednesday night but I didn’t let that stand in the way of the schedule so I baked five cakes beginning at 11:43 p.m. I woke up on Thursday at 8:07 a.m. for My Big Day (cake poppin’ of course). 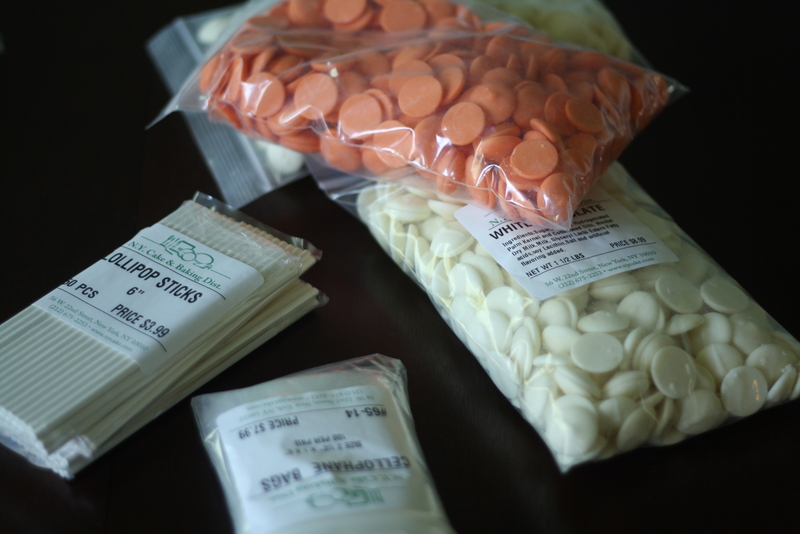 Supplies included 150 lollipop sticks, 200 cellophane bags, and 6 pounds of chocolate in white and orange. The tipsy baking actually turned out pretty well. 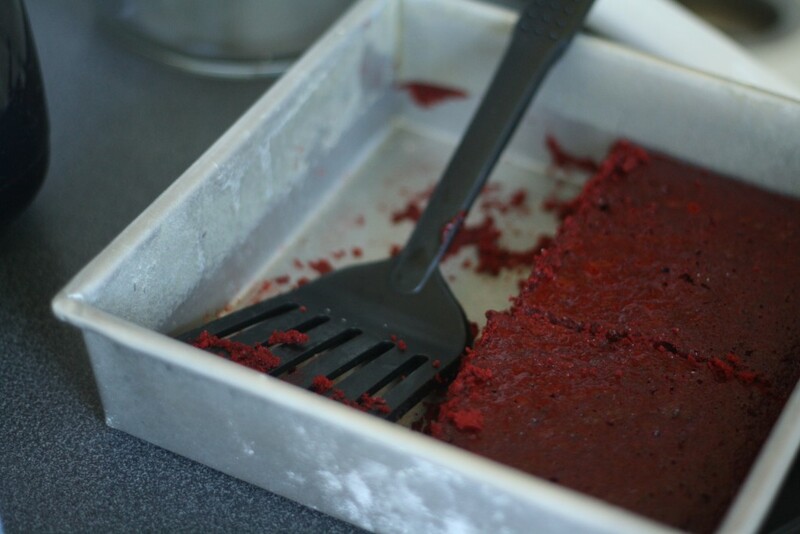 Homemade red velvet cake made in three batches and made in various bakeware: one 9×13 pan, two 9-inch rounds, and two 8×8 squares. 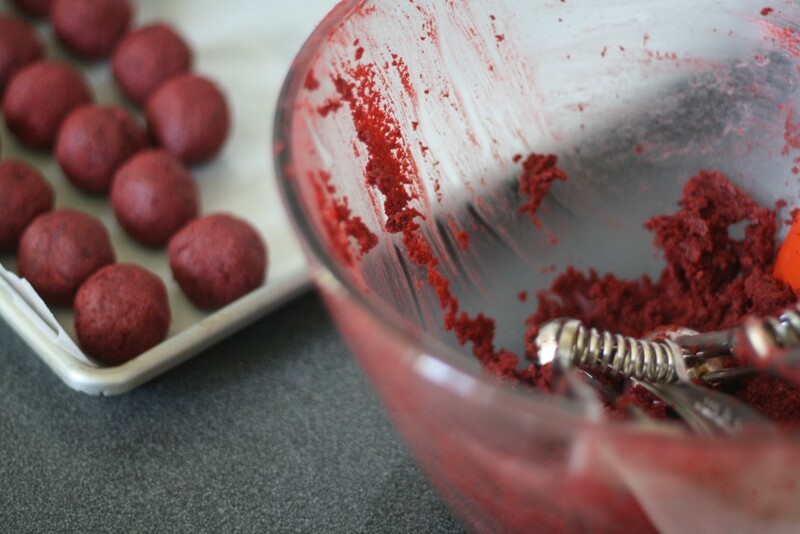 Before I get to far along – perhaps you are unfamiliar with cake pops? A cake pop is a fully cooked cake, mixed with frosting, rolled into balls, stuck on a stick and dipped in chocolate. I have been gazing from afar for a long time but I have a whole new level of respect for The Queen of Cake Pops. Like major. 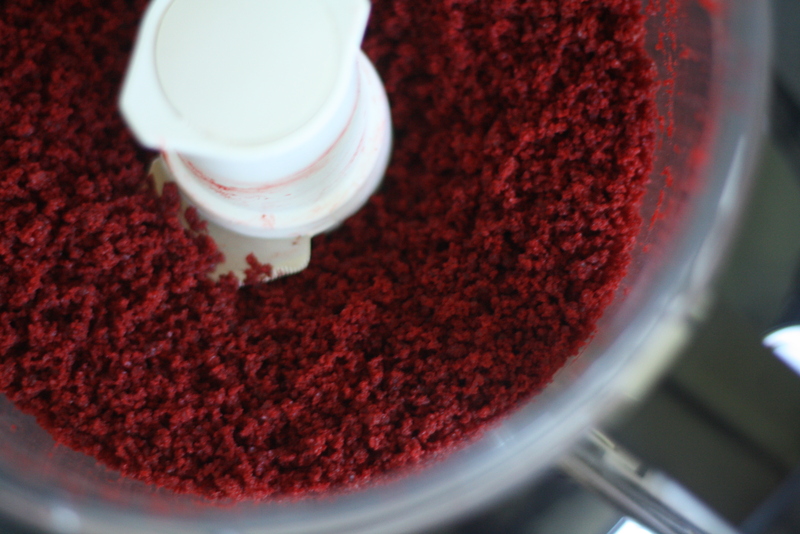 Batch by batch I processed the fully cooled cake in the food processor which made things super quick. Three batches = three large bowls. Set ‘em up. Knock ‘em down! Mix 1 cup of cream cheese frosting into each bowl using the back of a spoon. 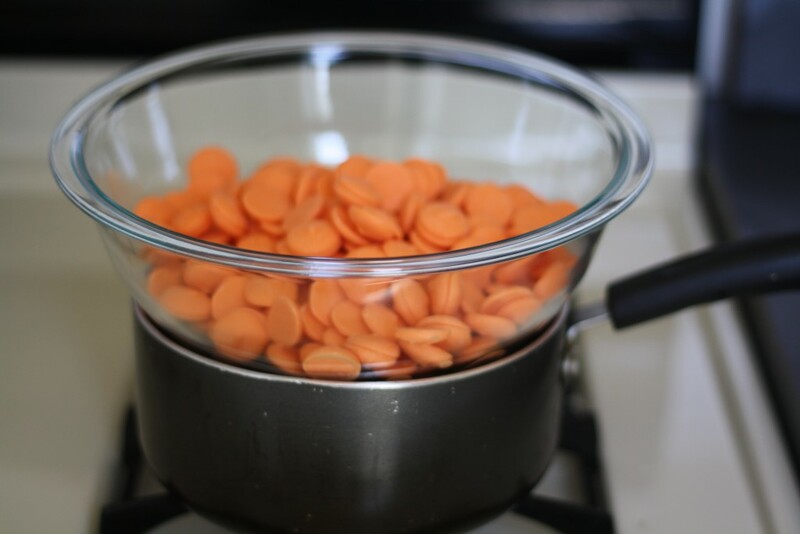 Start shaping one bowl and let the remaining two bowls chill in your fridge. I used a tablespoon-sized scoop to measure out the cake, rolled it into a ball, then placed it on a wax paper-lined baking sheet. You should get 50 cake balls per batch of cake. 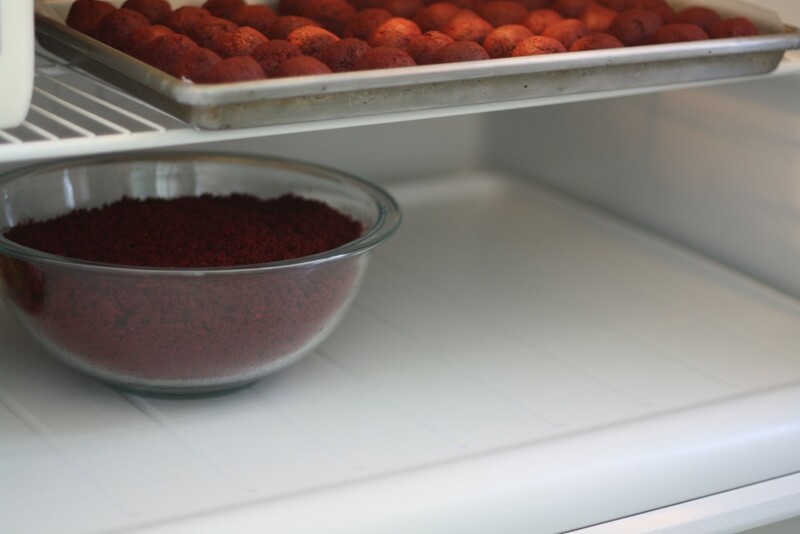 Rolled balls go in the fridge, another bowl comes out and continue until all the bowls magically turn into sheet pans of cake balls. 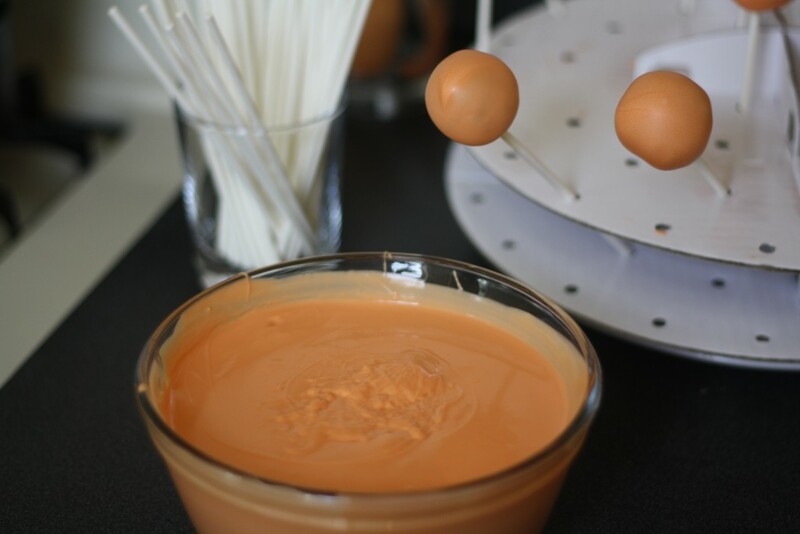 After all the balls are formed, they get popped onto a stick and dipped in chocolate. Melt chocolate in a medium bowl set over a pan of gently simmering water. 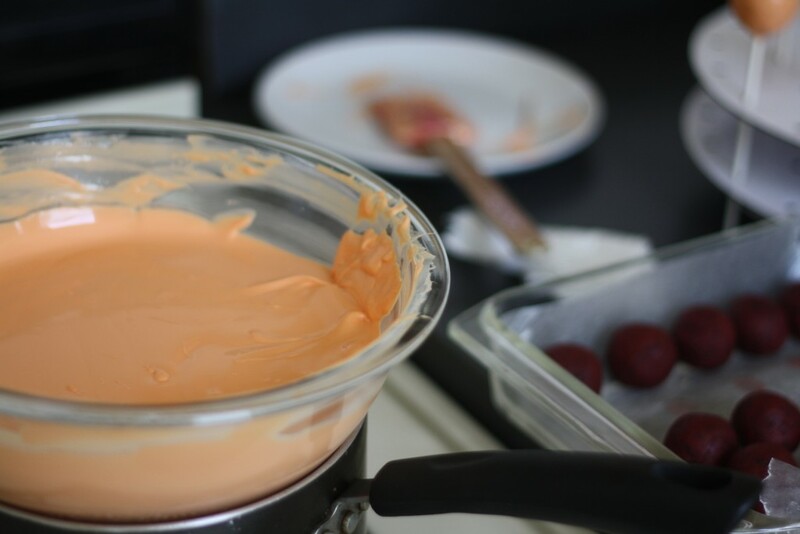 To get the light orange color, I melted together one pound of orange and one pound of white candy melts. It takes a while to melt two pounds of chocolate so use this time to get everything set up. I purchased a foam block and poked holes in it to use as a makeshift drying rack. I also found this amazing contraption for $3.99, which literally saved my life as I found you need a station for drying (post-dip) and storing upright (post-drizzle and pre-wrap). After the balls had chilled on the sheet pans for a few hours, I transferred them to a glass baking pan and stored it in the fridge. I’d take out a handful at a time and let them warm up on a plate before giving them a quick re-roll (to make sure they were round and smooth) and then dipping in chocolate. Set up your dipping station: melted chocolate, sticks, and a drying rack. First dip the stick into chocolate then then insert in to the ball. This ensures that the stick will stay where it needs to and also makes the point where the chocolate surrounds the stick extra pretty. Once the stick is in, dip the pop straight down into the chocolate and tilt the pop back and forth so the whole ball is covered. Gently shake off the extra chocolate and allow it to drip back into the bowl. Carefully transfer to the drying rack. Repeat 149 times. They will all look like this! Just kidding! 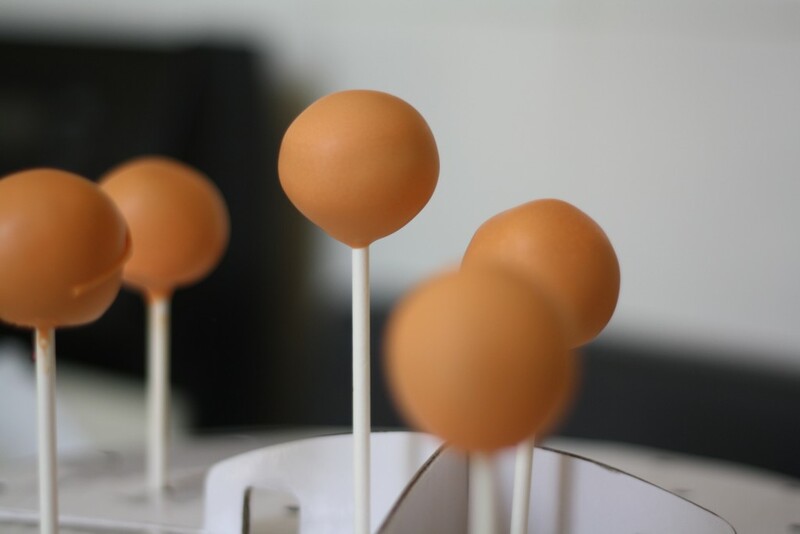 While it is true that most of them will look like the above, cake pops are like pancakes and it takes a few tries to find your stride. But when you do you will become a cake pop machine. I found the dipping process to be soothing. When the rack fills up – transfer to the drizzle station. In another makeshift double boiler, melt about 1/2 pound of white chocolate. Transfer melted chocolate to a plastic pastry bag, snipe a tiny bit of the end off and drizzle the top of each cake pop with white chocolate. Store the bag upright in a drinking glass so it will be ready for the next batch o’ drizzle. Now is the time that you need a few friends to come over. Give them beer and snacks and it’ll be all good. While you are dippin’ n’ drizzlin’ and the cake pops are dryin’ you’ll need some help wrapping them up. Tiny plastic bags go over the cake, tie with a little ribbon and a cute tag. 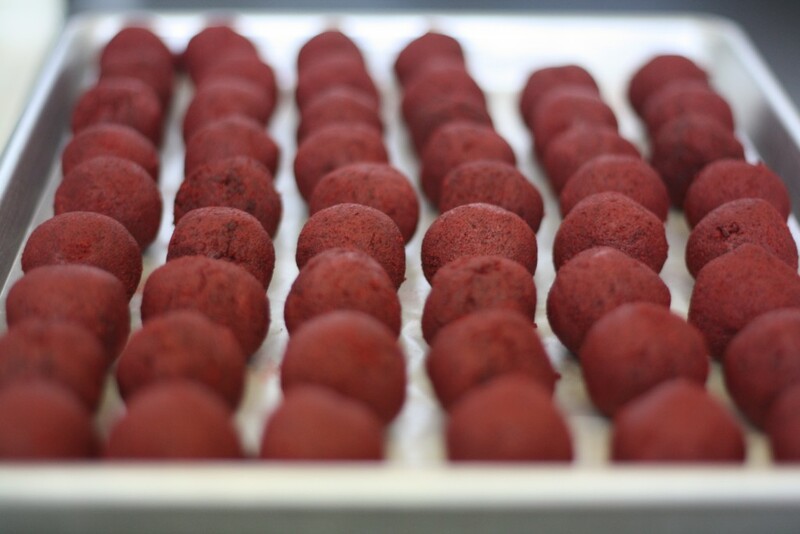 The chocolate shell dries hard but – just in case – I kept them flat until they were ready to be boxed up. Make sure you have several big boxes to carry them in because let me tell you, cake pops may seem tiny but when they are wrapped up you will need more space then you think. 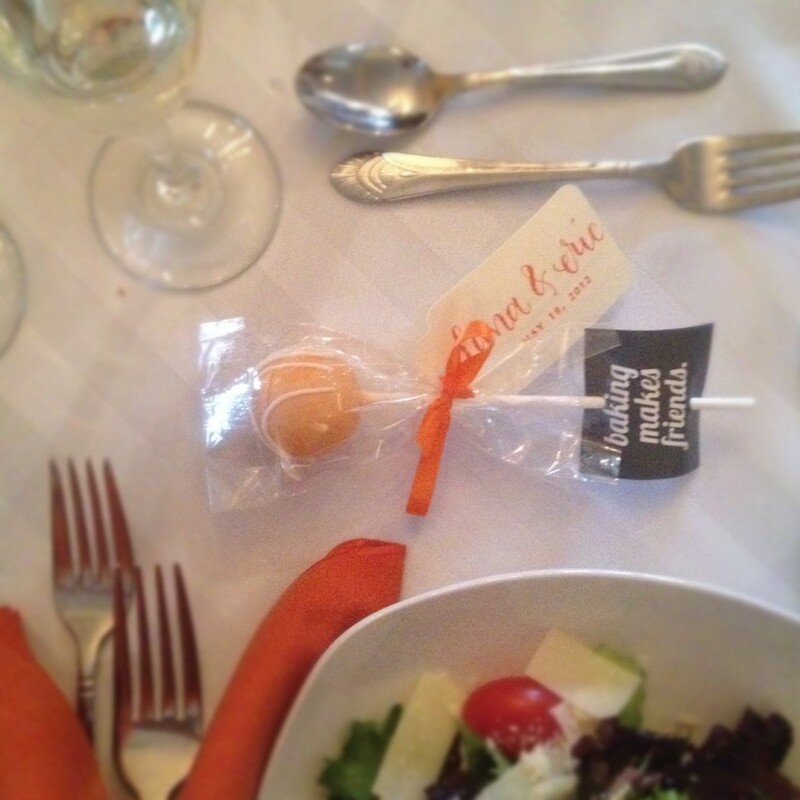 The cake pops you made for ‘your friends’ wedding was not only the perfect final touch for the tables, but they were SCRUMPTIOUSLY DELICIOUS!. They were a hit! Thank you Valerie!! What a perfect weekend of celebrating! Looking forward to seeing you soon! amazing! so impressed they came out so perfectly on your first try. oh, and that you made 150 of them! Oh, the cake pop experiment. These look amazing. Way to go Lil, and way to go Dana and Eric!!! Awww so cute!! Love this idea! What an amazing place setting…. kudos to the baker (and the packaging team, if I do say so myself…haha) ….THANKS LILLIE FOR A WONDERFUL ADDITION TO THE WEDDING…THE BRIDAL PARTY SALUTES YOU!!! Amazing!! I made 90 for a party last week and felt like a lot…congrats. Wow! What a process! They turned out so cute and delicious looking. 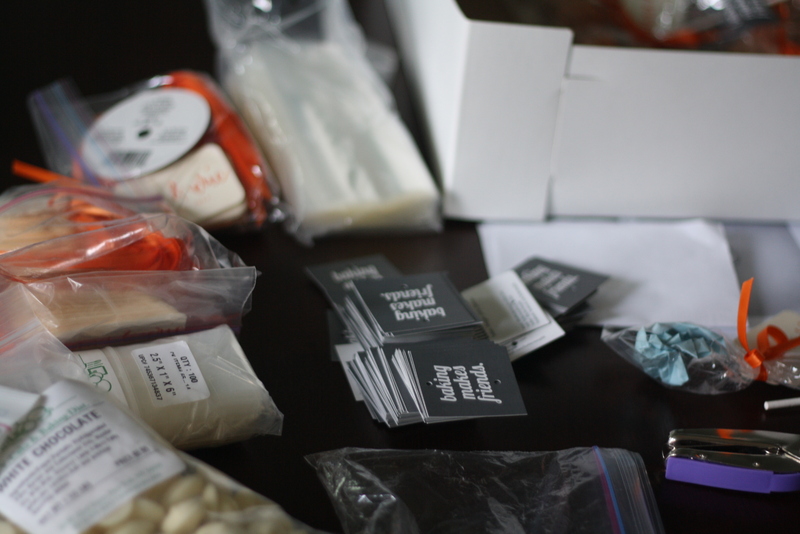 It seems like finding the right packaging materials is the hardest part. I think my first cake pop experience will be on a smaller scale! This is exactly the kind of situation I would find myself in. Thank you for taking one for the team and explaining how to do it for when it happens to me! Lillie, they were delicious! I’m not supposed to have dairy right now, but I couldn’t help myself. They were absolutely perfect for the wedding and super tasty on top of it! RESPECT!! Absolute RESPECT!! cake pops have been on my mind for a while ..but seeing you make 150 ..takes away any excuse I have to make a dozen!! beautiful!! Lillie, you are my hero. This time next year make sure you are in Seattle so you can bake for my kids’ carnival b-day party. Love your blog. Every recipe has been perfect (even without the milk). I also love how you hadn’t made them before and decided to make 150! Superstar! You are a cake pop SUPERSTAR! I’m sure Dana was thrilled–she’s so lucky to be friends with the world’s greatest food blogger (says Saveur and I) who’s willing to do this. Also, this reminds me of the time we went to Woodside, Queens, to visit the world’s worst David’s Bridal, and made a side journey of picking up supplies for this very venture, three or so years ago. OMG – 350!! I’m glad I could help! Good luck! whenever i’ve tried dipping cake pops (or oreo truffles) in chocolate, they come out globby. yours look fantastic! glad everything worked out so well for your friends’ big day! Did you make them very far in advance? How did you store them until the wedding…did they freeze well after decorating or did you just make them the day before? Hi Amanda! The wedding was on a Saturday so I made the cake on Wednesday, then rolled and decorated all the cake pops on Thursday. They were refrigerated (completely assembled and wrapped) until they had to make the drive (2 hours) up to the wedding. Then they were refrigerated on-site until the caterers placed one at each setting. I would think they would even be fine for a few more days if they were stored in the fridge. Hope this helps! These are amazing!! About how much did it cost to create these? Also, is there anywhere special you bought the colored chocolate to melt? I’ve never seen any like that, but I also don’t do much baking LOL! Thanks SOOOOOO much for this! I’ve never had to make these before and i was asked to make 200 of these for a christmas party… In two days! Hope my turn out like yours! Hi Kreisle! I’d love to see the final product! I am sure they will turn out great! Good luck! Hi Lillie! These look great! 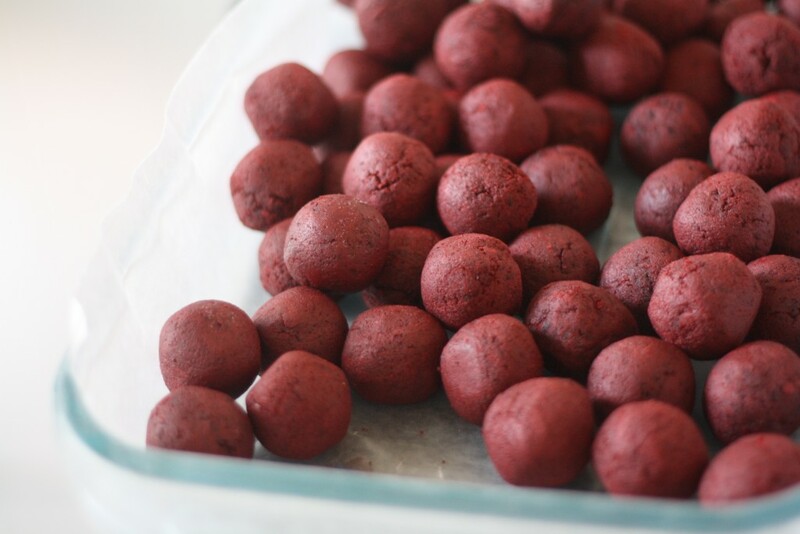 Two quick questions… How did you get such perfect shapes for your cake balls? Did you roll them or use some sort of scoop? Also, how early can you make them and how long can they stay packaged? I need 100 by Tuesday and am making them today. Can I package them and leave them out or do they need to go in the fridge and wait to be packaged until Monday? Hi Ashley! I used a small tablespoon-sized scoop to evenly portion out the dough then rolled them into balls and placed them on a baking sheet in the fridge to chill. Right before dipping (and after they had chilled for a while/firmed up) I re-rolled them to make sure they were extra round and smooth. Re: packaging, I wrapped and packed them up the same day I made them all then stored them all ready to go in the fridge until they were ready to be served. I would recommend packing them the day you make them because I found they were easier to store with the plastic covering the finished cake pops, rather then having them all stacked together without being wrapped. If you make them today (Saturday) they should be a-ok to be served by Tuesday! Hope this helps! Happy baking!! I love this idea so much that I’m going to attempt to make 200 for my wedding! Could you please tell me what size and brand cello bags you used? Thanks! Thanks Nancy! I used these bags to wrap the cake pops: http://www.nycake.com/cellobags25x1x6.aspx Happy baking! Wow, I will be making 150 cake pops for a wedding as well. thanks so much for the info. I will be using a cakepop maker though. Could you tell me what size bags you used? Wow, this is awesome! I plan on making cake pops for a school banquet and was wondering where you got both the square and sale tags printed?? Thank you! I designed the square tags in photoshop and then had them printed into 2×2 squares at Uprinting.com. The other tags were from my friend getting married but I seem to remember that she found them on Etsy. Hope this helps! Happy baking! Perfect tutorial! exactly what I was looking for as making cake pops for a wedding too . many thanks! thanks a lot for sharing im in your situation i’m making Oreo truffles to donate to our church’s fundraising i’m really excited will share the pics thank you be blessed. My big suggestion is to give yourself a few days. You can make the cake one day, roll it the next, and then dip and package on the day before you want to to serve them. Also, having a few people really helps. Here is a link to the stand. Happy baking! 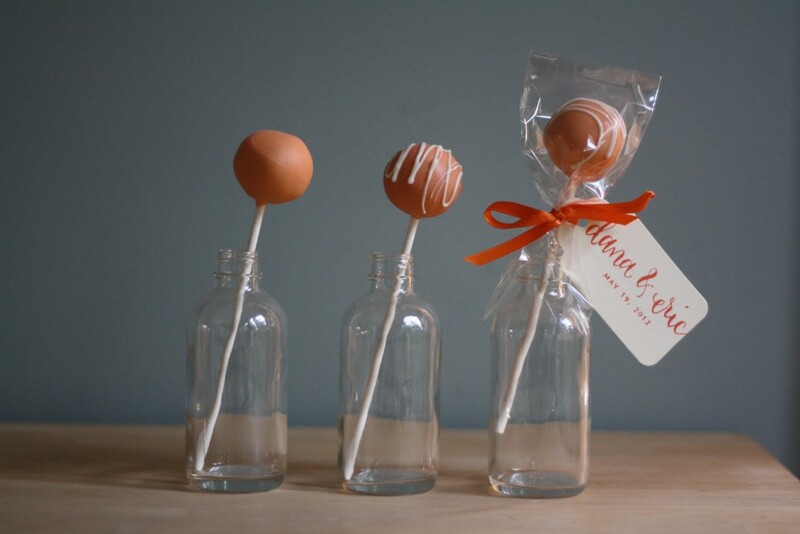 where can i buy those cute cake pop tags for my wedding? which is also in orange and white? I wish I had a source for you! My friend who I made the cake pops for supplied the tags, but I am fairly certain she ordered them off Etsy. I am making 200 cake pops for a friend. Can you please send me your recipe or let me know how much butter I need!!! Lbs. Can 2 candy melt packet can make up to roughly 100 pop cakes? I used about 6 pounds of chocolate for 150 cake pops. I would get about 4 pounds for 100 to make sure there is enough chocolate to easily dip the pops into. Happy baking! This has and will help me so much. I’m making 160 cake pops for my wedding as the cake for the guests. I was wondering if I package the pops and have them in the refrigerator the day before the wedding will they sweat when I take them out and have the display set up? How do I make sure they don’t sweat and look gross? Hi Eden! I think they should be fine as long as you are in a place that isn’t super humid. Happy baking! Love these! So cute and great directions. How much did you spend on supplies? Love the orange color~ Sounds like it was a blast making them! 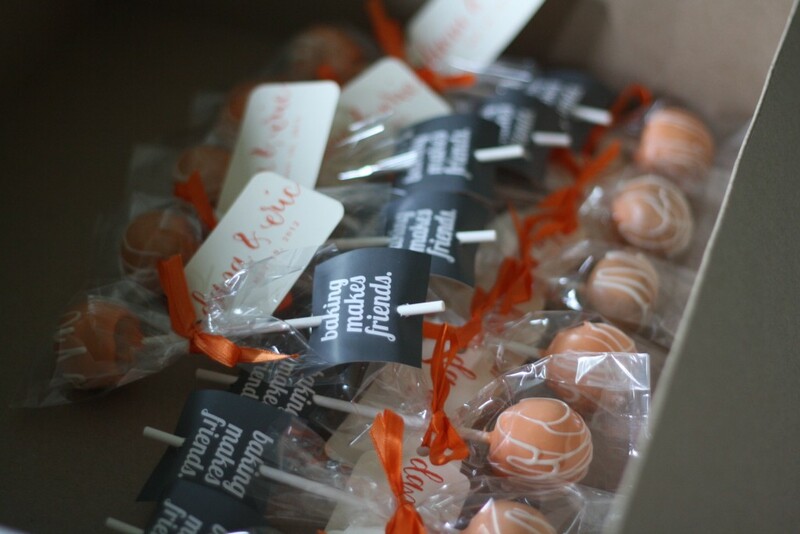 I’m curious what the font was that you used on your name tags…could you send it to me or tell me where to get it…thanks…you’re a brave girl making 150 cake pops with no experience…my biggest problem is getting the right size and dipping them where they look perfectly smooth…LOVE YOURS! How many Round 9×13 pans did you use? I used one 9×13 pan, two 9-inch rounds, and two 8×8 squares. what icing recipe did you use?